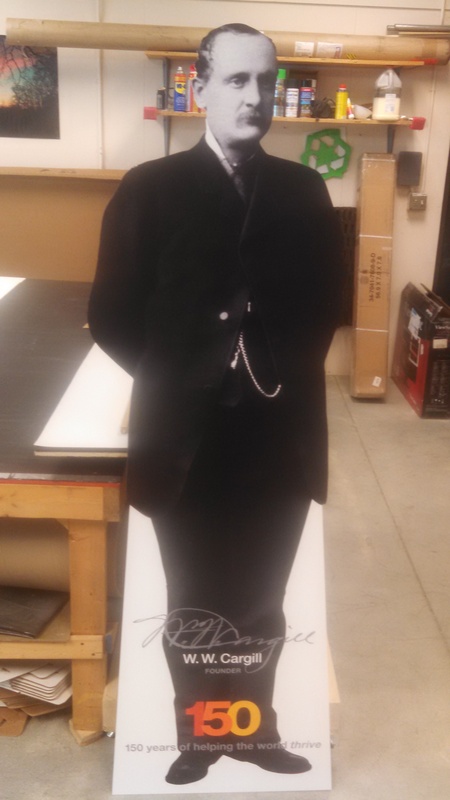 This is one of 150 people cutouts of company founder WW Cargill we did for Cargill Corporation as they celebrate their founding in 1865. We printed them on 3/16″ Ultraboard and used our computer cutting machine to cut them out. We shipped them to company locations all over the world- Brazil, India, Europe, South America and Asia as well as the USA. The people from Cargill are taking pictures of WW along with their staff and posting them on the Cargill website- it’s their version of Where’s Waldo and a lot of fun. Check it out. Generally when we do a single cutout we just do the cutting by hand. But for quantities like this, the digital cutter is faster and does a beautiful job. We are proud of the quality we are able to print for them, and pleased to be serving such a distinguished customer! This entry was posted in Flatbed printing and tagged cardboard cutouts, cutouts of people, die cut standups, people cutouts. Bookmark the permalink.